I'll cut straight to it today. This is one of those rare recipes that is easy, extremely healthy and completely delicious. Most of the time is spent baking some eggplant and sauteing some onion. And these two things can be done simultaneously. You don't even have to cut up a tomato since you'll be using the canned, diced variety. And given that it's pretty hard to find a tomato worth eating in March anyway, you win on both taste and ease by using the canned kind. I'm constantly surprised at how much I love the recipes I make from a series of books called Eat Up Slim Down! (The exclamation point is theirs, not mine.) Mostly because I usually eschew diet books since I don't really like the idea of making due with things like 2 tablespoons of cheese. But somehow everything I make from this series is wonderful. There was that Tomato and Watermelon Salad, one of my favorite salads ever, which really is better saved for when tomatoes are in season, not to mention watermelon. And then the Millet and Sweet Potato Cakes that I became so obsessed with I made them something like three times in one week. 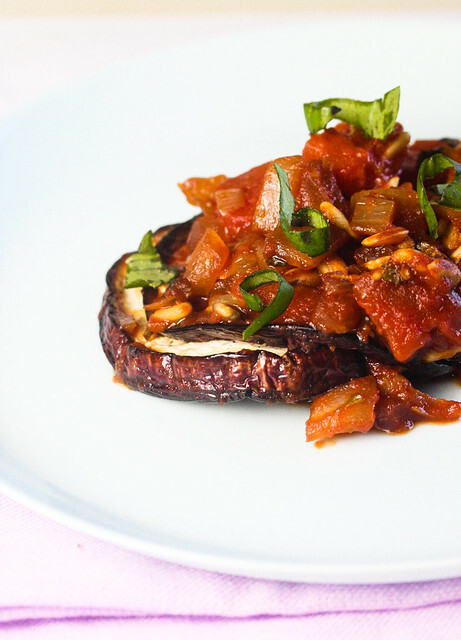 So I'm happy to add this Baked Eggplant with Tomato Chutney to the list. Basically you're going to slice an eggplant, and roast it in the oven while you saute some onion and garlic, cook it down with tomatoes, basil and balsamic vinegar, and then combine it all for one last stint in the oven. The recipe claims to feed four, but I think two is a more reasonable number for a main dish. Definitely four if it's a side or appetizer. I made a few changes to the recipe, upped the garlic as I tend to, and substituted sunflower seeds for pine nuts since pine nuts are just too expensive-feeling lately. Preheat the oven to 425F. Coat a 13"x9" cooking dish with spray and set aside. 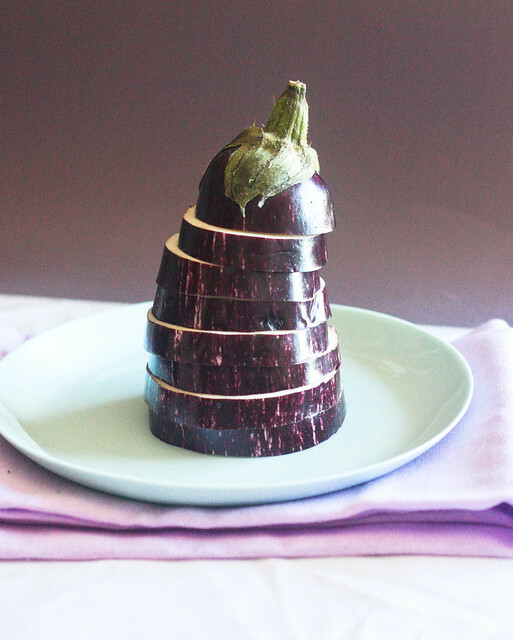 Cut the eggplant into 1/2" slices and brush them on both sides with a little oil. Sprinkle with salt and pepper on both sides, then place them in the baking dish. Bake for about 20 minutes until tender. This might vary depending on your oven, and it could take up to 30 minutes. In the meantime, preheat some oil in a saute pan over medium-high heat and cook the onions with the garlic until the onions are soft. Add the vinegar and basil and cook for one minute more, then add the tomatoes and simmer for 5 minutes. Remove the pan from the heat and add in the nuts. Take the eggplant out of the oven and spoon the tomato mixture over the top. Return the dish to the oven for a final 7-10 minutes, until heated through. 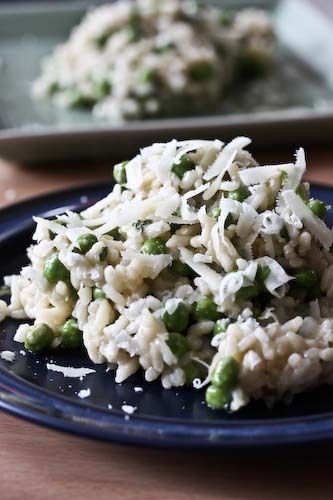 Serve with a sprinkling of fresh basil over the top. Jenna, it's possible that the white background wasn't loading properly and that you were just getting the arabesque background, which is only supposed to show up on the sides. It should be working now, but let me know if you continue to have trouble. This looks splendid! Baked eggplant sounds delish! let's face it !! I could never ever resist eggplant !! your recipe is made for me !! Eggplant is my favorite vegtable! This looks fantastic, thank you for sharing! wow, i love this recipe since i now alergic with some food. I will try this at home..
Hi! I discovered your blog recently, and I've already made several recipes from it. Thanks so much for sharing your great ideas! I'm also a grad student who uses cooking to relax (a.k.a. distract myself from my dissertation), so it's great to find out I'm not the only one! For this recipe, I couldn't find any eggplant at the supermarket, so I wound up using an enormous zucchini instead. It came out great, so that's something to consider for when eggplant's not available. I'll definitely try making it with eggplant the next time I see some, though! I love eggplant and tomatoes! I'm saving this recipe now. Gotta try this at home. Thanks for sharing! That looks good and I like the sound of the tomato chutney!